Exmordium are an international band with members from Canada and the United States with Wisconsin and Ontario being their home bases and they play an atmospheric mixture of black and death metal and this is a review of their 2015 ep "Into The Sepulchral Spectrum" which will be re-issued in July, 2017 by Tridroid Records. Classical guitars start off the ep and after the intro the music goes into more of a heavier, darker yet melodic musical direction while the fast sections bring in a great amount of blast beats and tremolo picking which also gives the music a raw feeling along with some black metal screams. A great amount of death metal growls can be heard quite a bit throughout the recording while the songs also bring in a great mixture of slow, mid paced and fast parts and classical guitars are also mixed in on some of the other tracks as well and when guitar solos and leads are utilized they are done in a very melodic fashion and a couple of the tracks are very long and epic in length and elements of thrash are added on the closing track. 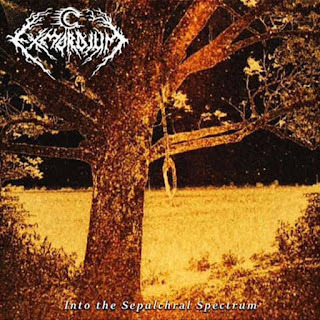 Exmordium plays a musical style t hat takes and old school form of atmospheric black metal and mixes it with death metal to create a sound of t heir own, the production sounds very raw and heavy while the lyrics cover war, death, Paganism, Vikings, Anti Religion and philosophy themes. In my opinion Exmordium are a very great sounding mixture of black and death metal and if you are a fan of those musical genres, you should check out this band. RECOMMENDED TRACKS INCLUDE "Portals Beyond The Imprisonment Of Time" and "Severing The Roots Of Yggdrasil". 8 out of 10.